We are riding on pure joy and adrenaline from a night that we will never forget at the Apollo Theater. The Apollo was the venue that started it all for us, and we couldn't have thought of a better place to celebrate the 30th Anniversary of Hangin' Tough with you! For those of you that were there — you know we love you! For those of you that were there in spirit — we of course held all of our Blockheads close to our hearts. Today is a very special day and one that we couldn't wait to get here. As we hope you have heard by now, 2019 will be a busy year because we're going BACK ON TOUR! This morning on the Today Show, we announced our most extensive tour in years, THE MIXTAPE TOUR. We will be kicking it off in North America in May 2019. We know that so many of you around the world are waiting for us to return to your city. We are planning and plotting and hope to make it to you soon. This will be a tour not to missed and we're bringing with us some VERY special guests. 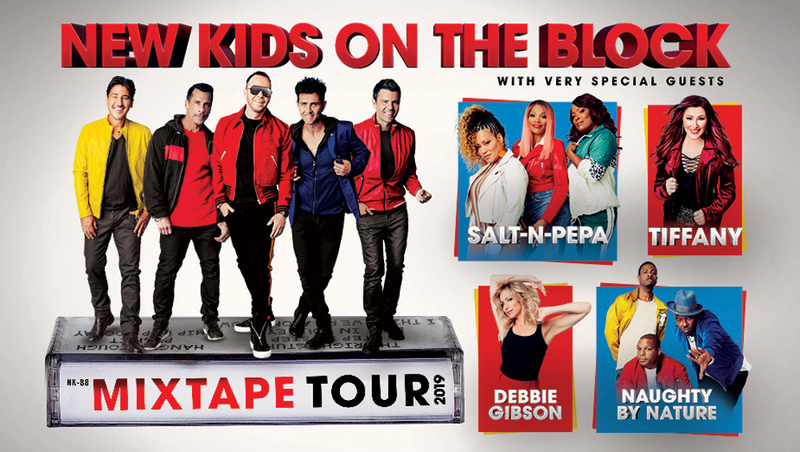 Don't miss the Mixtape Tour with Special Guests Salt N Pepa, Tiffany, Debbie Gibson and Naughty by Nature. WOW… can you believe that??? But there's more! We are thrilled that we have been in the studio making new music. The first song, called "80s Baby," was released today. We hope you love it as much as we do! We asked our Mixtape Tour guests to join us on this track. Check out the links below. Also, our friends at Sony Music are also working hand and hand with us on a special Deluxe Anniversary edition of Hangin' Tough to be released early next year. We are working hard with them to make sure this is an item all of you will have to add to your NKOTB collection. We can't wait for this very special time to get crazy with all of you and make many new memories. Don't miss the on-sales and grab your VIP packages and tickets while you can. We have worked with our team to make as many great tickets available to you and create a stage production that brings us all closer together. Information for the tour — including ticket pre-sales, ticket on-sales, and VIP packages — is below. See you all soon. Let's make some Mixtape memories together! * Beginning on October 9 @ 10am local time, log in and go to the EVENTS page where you will find your unqiue presale code (top of page). Scroll down the tour schedule to find your show date. * REMINDER! Your website login credentials are: email address + your current password. CLICK HERE if you need to reset your password. * Members may purchase up to 4 tickets per show with a member presale code. * VIP PACKAGES: Members receive early access to VIP Package offers. CLICK HERE and get full details on VIP Packages and limited Meet & Greet Upgrade opportunities.